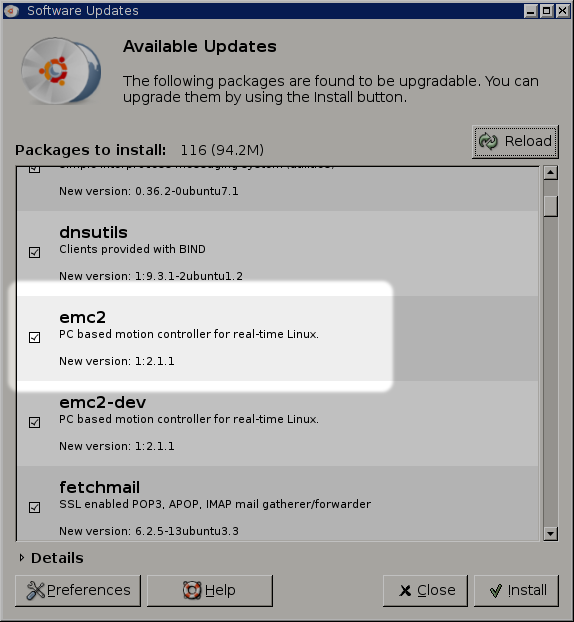 On Ubuntu, you can install bug-fix updates of emc by using the Ubuntu package manager. When updates are available, an indicator appears (generally at the upper-right corner of the screen). Here, you see a system which has version 2.1.0 installed. Clicking "Install" will update to version 2.1.1, as well as upgrade the other Ubuntu packages shown. If you do not have a network connection on the machine where you run emc, you can download a ".deb" file and transfer it using a USB drive or any other method. The emc 2.2 dapper packages are located here . Hardy packages are located [here]. Other packages (e.g., older versions or simulator version) are located in other subdirectories of the repository. depending on your system, double-clicking them in the file browser may also install or upgrade the package.